Very good news for the Guatemalan exporting industries and its 2017 year-end results. Following two years of steep economic decline, on 2017 exports of goods and services generated foreign exchange for US$ 11,001.5 million. The growth rate is of 5.3 compared to 2016 and reached a historical number for Guatemala. Following two years of steep economic decline in Guatemalan exports, the country finally reached a positive year in 2017. Official data showed the country ending 2017 with a total of US$ 11,001.5 million in exports, 5.3% higher than the 2016 figure. Among the factors, exporters have identified for this outcome the recovery of the global economy and the 17.3% increase on international prices of traditional products. This outcome is mainly related with the fact that export companies took advantage of 6 sales tools launched by AGEXPORT on 2017, along with worldwide opportunities generated by the economic recovery in the country’s main markets. Guatemalan exports are one of the main employment generators at an urban and rural levels with more than 1.6 million employments and self-employments created at a national level. If exports increase, also formal employments increase. Said AGEXPORT´s Chairman, Mr. Antonio Malouf. Non- traditional products also had an interesting increase in 2017: a total of US$8,159 million, increasing 2.2% compared to 2016. At the beginning of 2017, “The Trump effect” was discussed with great uncertainty. Today, we are witnessing an increase in the United States’ economic growth to 2.4% (of 1.6% in 2016,) causing its global imports to increase by up to 6%. The United States remained as Guatemala’s main trading partner, with 34% of its exports destined to the US. This also implied a 9.3% increase of exports compared to 2016 (equaling additional exports of US$271.7 million) of products such as clothing, bananas, coffee, fruits, sugar among others. Said Mr. Malouf. The economic conditions of other key markets for Guatemala also recovered and it translated to increasing exports for Guatemala. Some of these countries are the European Union and the BRICS [acronym for an association of five major emerging national economies: Brazil, Russia, India, China and South Africa). This scenario played an important role in increasing national exports to other key markets like Central America (2%), the European zone (7.6%) and Mexico. As well, the Peruvian market increased its imports of Guatemalan products by 144.36%, followed also by Saudi Arabia (69.99%). The global economy is opening opportunities, this is the time where Guatemala needs to cleverly decide to provide support to our local producer of exporting goods and services; otherwise these opportunities will be taken by other better-prepared countries. There are still important challenges to look at like the development of the National Infrastructure Plan, investments to increase efficiency at the Santo Tomas Port, shifting bureaucratic processes to the digital era, paperless trade and increasing transparency measures. Also, provide legal certainty to investments, training the local talent with global competences (English and technology) and approve agile legislations to adapt to the rapid global changes and the impact of the Fourth Industrial Revolution. Said AGEXPORT’s Chairman. 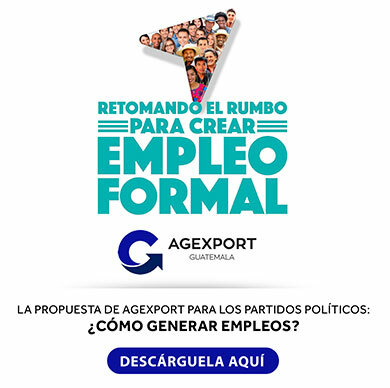 According to AGEXPORT´s Chairman, for 2018 there are issues needed to be addressed in terms of legislation for competitiveness, generating more investments and employment opportunities, amendments to the free zones legislation, boosting credit for small and medium enterprises and a solid INSTITUTIONALITY to promote trading, investments and employment. The institution has prioritized innovation as a way to widen export possibilities, integrating new strategies to diversify products and exporting services. This is why the Innovation, Research and Development Network (l+D+i Network, for its acronym in Spanish) created the “Agexlab Maker Space”. Additionally, we achieved the approval of a non-restrictive laboratory list with the Environmnent Ministry, an issue that was on hold for years. Said Mr. Malouf. To increase the country’s competitiveness there are specialized areas that look to simplify processes, for example, the Competitiveness Observatory platform, which provide updated data information regarding Guatemalan exports’ competitiveness performance and the first digital platform to ease international businesses: “Connecting Best Markets”. This year was good for all exporting sectors, which has to do with the teamwork among exporting businessmen, allies that support this activity and AGEXPORT. For example, it is estimated that vegetable, fruits and flowers exports, among other non-traditional agricultural products, reached the end of 2017 with US$ 1,089 million, 13% higher than a year before. In the case of service exports, it has been estimated an income of foreign exchange of US$ 339.9 million, with a 13.2% growth versus 2016. The aquaculture and fishing industry registered a 13% growth compared to 2016, with total exports worth US$256 million. The manufacturing industry, for its part, registered exports of US$ 4,560 million with a 8% increase compared to 2016. Finally, Contact Centers & BPOs exported around US$ 750 million, staged compared to what was estimated for 2016. Stated Antonio Malouf, President of AGEXPORT. 2018: AGEXPORT aims to have more Guatemalan exporters. The establishment of an ‘exporting route’ will seek to position all AGEXPORT partners adequately to develop its exporting capacity by bringing new opportunities, markets and problem solving; as well as advisory for the design of innovative products, links with customers, participation at national and international events, training, among others. The whole system is managed in a tailor-made way according to the realities and needs of each company, aiming to become an ally to help the firms grow through its exports. Said AGEXPORT’s CEO, Mr. Amador Carballido. ¿Todos los proyectos, obras, industrias o actividades tienen la obligación de contar con licencia ambiental?